Reading through the pages of Francine River’s book (Leota’s Garden); I realized once again that there is no such thing as a perfect life… Never mind, it’s just me – Novels have a way of travelling me out of where I am into a totally different world. But that said. I’ll just get straight to my point.There are no perfect people. And in my opinion, that’s just the truth. Boy! we all need the Grace of God. 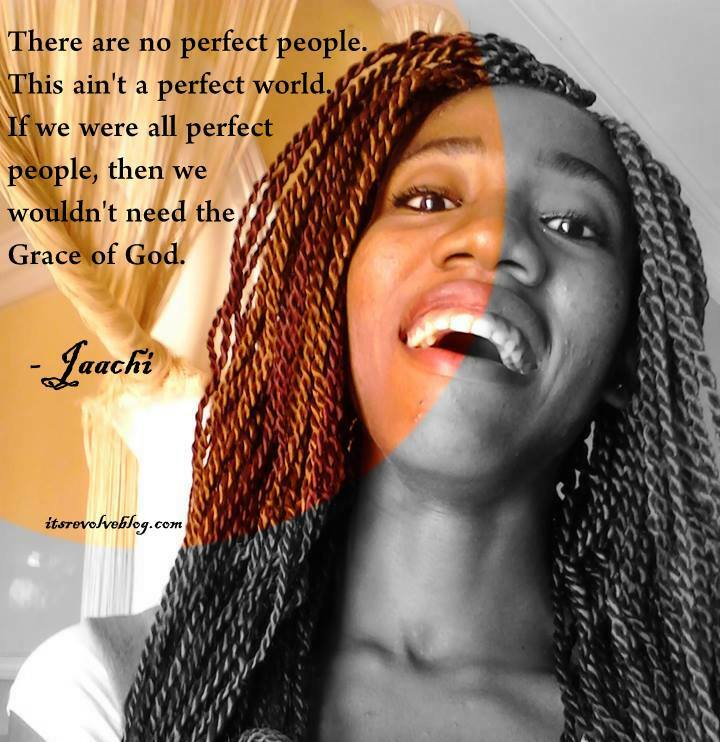 If we were already perfect, then we wouldn’t need Grace to help us with our flaws. And if we were all perfect, then we wouldn’t even have flaws at all…but we do, yes we all do. And we need God’s Grace for our flaws and imperfections. For me, it’s like the more I draw nearer to God, the more I realize my imperfections. The more I get real and truly open with God, the more I realize how I can’t be strong on my own. I have flaws, I have my weaknesses. I still have things that I pray to God to help me deal with. I’ve been insecure (and sometimes I still feel that way), I get shy sometimes, and I don’t even know why. Some days, I really want to be bold, but it doesn’t just happen – I still get nervous. I am not perfect, I don’t have it all figured out, but I know I have A Perfect God who knows me too well. He loves me just the way I am, and He loves it when I trust Him to help me with those imperfections. I feel like, admitting to our imperfections even draws us closer to God, because when we confess that we can’t do it on our own, that’s when we become poor in spirit…that’s when we acknowledge that we truly need His Grace. We are not perfect people (literally speaking), but we have A Perfect Spirit living inside of us. We may be weak, but He is strong in us. We can’t do it on our own; therefore we totally need His grace for our flaws. Every day, He is growing us…every day He is teaching us…every day He loves us…and every day, He wants us to trust Him. There are no perfect people, this ain’t a perfect world. If we were all perfect people, then we wouldn’t need the Grace of God.